Is Link from the Zelda games left-handed? | Eugene is huge! Is Link from the Zelda games left-handed? Yes, he is.. except for when he isn’t. In 3D, he has been decidedly left-handed, as he holds his shield in his right hand and sword in his left. However in 2d incarnations he is left-handed 75 percent of the time, except in Zelda II where he is left-handed 50 percent of the time. The way he is drawn, he holds his shield in his right hand when he is facing up, down, or left. This is reversed when he’s facing right because it was easier to swap the sprites instead of drawing entirely new ones. In Zelda 2, he is right handed when he faces right and left handed when he faces left. 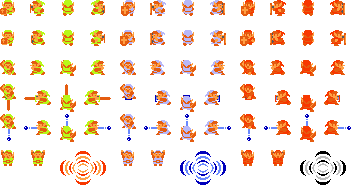 See this sprite dump from Zelda 1. Left handed 75 percent of the time. This entry was posted on November 16, 2016 at 4:49 pm and is filed under Nerdy Stuff. You can follow any responses to this entry through the RSS 2.0 feed. You can leave a response, or trackback from your own site.